Down Payment for Designers - Distant Dream or a Surprising Reality? Whether or not to charge a down-payment from clients before starting a project has always remained a debatable topic in the freelance graphic designer community. After all, you’re signing the terms and conditions stipulated by your client, which means you’re bound to abide by the deadlines, payments and schedule set by the client. Most such terms and conditions laid out by clients protect them financially and not you. In fact, clients reserve the rights to pull out of the project any time they wish to, at their will! Well, you’ve been working dedicatedly on a project, spending your time and efforts to craft a custom logo design or a killer site design for the client! And it could really disappointing if you get to lose the project midway. Wouldn’t it be good if you had the security amount (a down payment) to protect you against such contingencies? 1. Down Payment Will Keep Both Parties Happy – By giving the down payment, the clients ensures the designer that, “We will be with you till the end of the project?” On the other hand, it keeps the designer motivated to complete the project on time with a satisfied mind of receiving the balance payment at the completion of the project. 2. Down Payment Builds Trust – A down payment is the way of clients showing trust in you and your work. They pay you a good amount of money even when their project is not completed means that they have confidence in you that you will complete the project well and on time. Down payment will not let the client walk away at any point of time. If the client has invested and signed the contract, they will remain with you till the end. So, if the question is – whether designers actually deserve down-payments? The answer is a resounding YES! Okay! 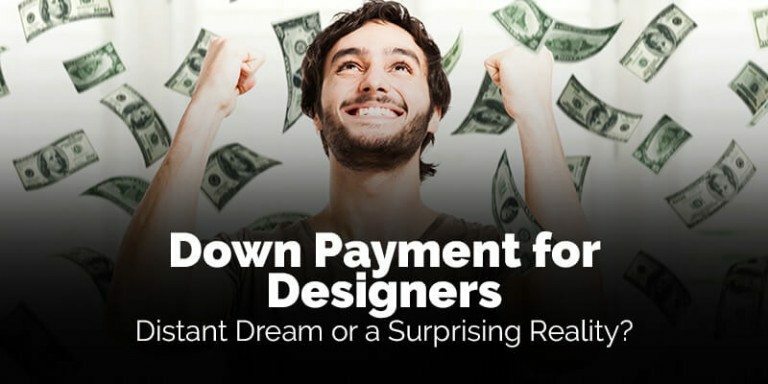 Now, you understand that designers do deserve a down-payment! But you wouldn’t disagree that it’s not too easy to convince the clients to pay just any amount. Remember, they too try to pay as minimum as possible and that too with a lot of terms and conditions. So, how do you convince your clients for down-payment? Confused? 1. Draft an elaborate agreement with details of down-payment and payment schedule. Before you take up any assignments or make any commitments, make sure that you have presented the standard agreement to your clients. It is mandate, trust us. 2. Be clear with your communication. Let your clients know the specifics of what you are expecting from them in terms of payment. The more professional and detailed you’ll be with your communications, the better will be your chances to convince your clients. But remember, communication is a two-way street. So, listen to what your clients have to say. 3. Use invoices. All invoices have payment terms listed on them. Show your client invoices that you’ve sent out to other clients to make them feel secure. Be as clear and specific as possible on your invoice. Do not use any industry jargon in your product or service description on your invoice. If your invoices clearly indicate down-payment, your clients wouldn’t paying it upfront. 4. Give references of your existing clients to the newer ones to make them feel more secured about their decision to work with you. Update them about things you’ve done in the past and your achievements. This will ensure that you’ve thorough understanding of your work and they wouldn’t be hesitant to pay a down-payment. 5. To get down-payments, you’ll need to build a strong relationship with your clients. If you get to hear from a client, walk them through all key deliverables and payment dates at the start of the new project. Give them enough time to make a decision. But don’t forget to follow up with them. You’re looking for a down-payment to safeguard your financial interest right? So, why not do what smart designers do? Participate in Designhill’s One-to-One Projects! Participating in Designhill’s one-to-one projects has many advantages. But what really makes these projects worthwhile is the security of payments for designers. You’ll be able to negotiate and finalize payment terms of your project directly with the clients. In one-to-one projects, payments are securely deposited with Designhill. So, even if a client chooses to abandon the project midway, your money stays safe and secured. Don’t worry, you don’t need to pay anything or start bidding in order to participate in Designhill’s one-to-one projects. All you need to do is to create a free portfolio at the site to lure clients to invite you to their one-to-one projects with your unique, exceptional graphic designs. Finally, a risk-free way to participate in design projects. Create Your Design Portfolio Now!!! Previous Previous post: How To Upsell Your Next Design Project?